Swords Sovereign is the 12th series modules at the sword . 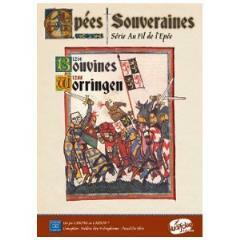 It covers two of the most important battles of the thirteenth century, Bouvines (1214) and Worringen (1288), where the knights as pedestrians have played an important role. Balanced, in terms of numbers and value of the troops engaged, the two battles are also decisive in their impact, both for the victors than the vanquished. Bouvines and Worringen have also played a special role in the development of French national feeling for the first and the second Belgian. During the summer of 1214, Philippe Auguste is facing a coalition against him by Otto IV, Holy Roman Emperor. The King of France gathered his vassals on his side, including the Duke of Burgundy. The two armies are arguably less than 10,000 combatants: approximately 9000 to Otto and just over 7000 for Philippe. The battle began on the left wing of the army of Otto, where Ferrand Count of Flanders was defeated by Eudes, the Duke of Burgundy and Brother Guerin. On the other wing, the fight is more balanced. Side of the royal army, Robert de Dreux must fight tooth and nail against William Longsword and Renaud Dammartin that threaten the bridge of Bouvines. But it is central that the decision will be made. With its numerous infantry, Otto tries to capture Philip II by directing his attack on the king's person. The French knights also charge towards Otto is thrown by Enguerrand de Coucy. But soon Philip is also grounded. The men at arms and knights of both sides are working to protect and save their sovereign. Side of the King of France, stirred the Oriflamme to restore courage to the fighters. Eventually, the knights of Philippe eventually push their advantage. Sunday of Bouvines ended with a decisive victory of the King of France: 170 enemy knights are slain, 128 others were captured and ransomed and lost the rank and file amounted to over a thousand. The victory of Bouvines is also behind the development of a truly national sentiment in the already old Capetian kingdom. The battle between a coalition around Siegfried II Archbishop of Cologne, who sees a dim view of the rise of the Duke of Brabant. Siegfried has the support of Henry VI of Luxembourg, the latter's brother, Waleran I, Count of Ligny, and Count Adolph of Nassau, in order to defend Renaud of Gelderland. For his part, Jean de Brabant gathers around him the Counts de la Marck, Loon, and Tecklembourg of Waldeck, who seek to free itself from the influence of the Archbishop of Cologne, as well as some French knights, as Hugues and Guy de St Pol. The two armies, reinforced by communal militia, peasants and sergeants, are of approximately equal strength: 4800 fighters for the Duke of Brabant, of which 2300 riders, 4200 to the archbishop of Cologne in 2800 with riders. The citizens of Cologne have in turn taken up the cause of John of Brabant. Although initially manhandled on its left side, the Duke of Brabant managed to restore the situation with his knights who charge in ranks, while maintaining a relatively good coordination with the infantry. The climax of the battle, which lasted into the afternoon is when Henry VI of Luxembourg throws his spear and his sword to try to catch head on Jean de Brabant, the better to throw. Henry receives a mortal blow. After the fierce battles, John of Brabant won a great victory that allows the emergence of a powerful duchy of Brabant now integrating Limburg.